Every year around the same time something magical happens in Houston. It’s a time to come together and celebrate what we’ve been able to accomplish in a year and what we have planned for next year. It is also a time to hawk your company’s wares, to wine and dine potential customers, and to show how your company out shines all the others. What is this event? Is it Christmas, Valentines’ Day, or Guy Fawkes Day? Nope, it’s the Offshore Technology Conference (OTC). 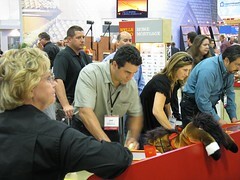 The OTC (not to be confused with the OC) is one of the 200 largest trade shows in the nation. This year it was held from May 1 through May 5. It consists mainly of companies that make things or provide services for the offshore oil and gas industry. It brings an extra 50,000 plus people to Houston each year (people living out toward Reliant Stadium do not look forward to this). This includes everything from oil rigs, engines, life boats, shoes, and rooms (yes you can take a look at perform room). When most people think of the offshore oil and gas industry they just think about the rigs, they don’t think about all the different services and products that are going on behind the scenes. For example: shoes. People working rigs in the Gulf need shoes. Should they just bring there own? Should the company they work for provide them with shoes that are kept to a certain design and safety standard? And where will the people on the rig live? What type of recreation should they have on the rig? 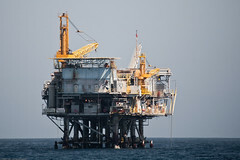 How will the rig data be stored or transferred? How tough do monitors have to be? Should they be touch sensitive? As you can see, there are a lot of products and services most people never think about (I even got to see some solar powered warning lights). Each booth tries to out do the others. There are models of ships and rigs, cheerleaders, 3D TVs, large konect like toy rollercoaster. “There was much of the beautiful, much of the wanton, much of the bizarre, something of the terrible” (Poe’s Masquerade of Red Death). Although my favorite part each year is the swag. Swag stands for the stuff we all get. The highlight of any conference is the random stuff you walk away with. And since each different company is trying to tempt you away from all the others, it can be an ADDOS’s person dream (Attention Deficit Dis… Oh shiny). Some of the highlights I’ve had throughout the years include a ball made of interlocking pieces that fold out and flip sides when tossed in the air, a list of all U.S. navy vessels, a combo flashlight, tape measure, screwdriver, and leveler, and, this year, two pieces of curved paper that create an optical illusion. Most of the swag I collect will eventually be given away to friends, family, and passerby’s. There is more to OTC then just cool cutting edge technology and free stuff. If you’re a veteran you have figured out a way to live off the land. Most booths will have a bowl of candy to hand out to people. Others have water and other libations. In the morning some have pastries (one booth this year had freshly baked cookies). Around lunch time, the larger and fancier booths put out lunches. You could grab a ham and cheese sandwich or try to hunt down the stir-fry. You could go an entire week without buying food. Now there are a few people (50,000) who do go there for other reasons. Each day there is a bewildering array of classes and papers on talks about all the latest and greatest in technology, procedure, science, and law. Attendees go to learn. I picked up several interesting periodicals talking about the new large fields off the coast of Israel and Brazil and all the challenges of bringing them online. There is also a teacher and student workshop. The workshops are put on by the wonderful people at the National Energy Education Development Project (if you’ve been keeping up with the blog, they will sound familiar). All in all, the OTC is an experience right up there with Disneyworld and the AAM annual meeting. For people in the industry it is a must. And for those not in the industry it is a chance, like Jane Goodall in Africa, to observe a unique industry in its natural habitat. Did you see the hologram of a platform at the Exmar booth? It was AWESOME!